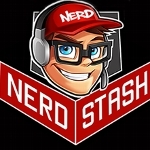 Welcome to Team Nerd Stash, We are a Community of 12 amazing streamers who dedicate time and stream on our Community channel on Twitch 7 days/365 all year-round for the cause. In 2018, you helped us raise over $30,000 for The Kentucky Children's Hospital and many other hospitals throughout the United States when our initial goal was $25,000 for the year! So many thanks go out to our amazing community, lurkers, subscribers, followers, cheerers. and support system throughout Twitch. Some of you walked away with TONS of games, swag, and much more as a reward for your donations for this special cause we love so much. For ALL of you who helped, we thank you! So as we begin 2019, our team is on a mission to do even more this year and raise the stakes to help sick and injured kids for the Kentucky Children's Hospital and we need your help. These kids are facing scary stuff like cancer, cystic fibrosis, and injuries they may get from just being a kid. Our Channel on Twitch is dedicated to doing all we can to give back to Extra Life and the Kentucky Children's Hospital and was the sole purpose of why we do what we do on Twitch each day. We take it to the next level and our team has BIG hearts for the kids! We a take all donations, tips, subscriptions, bits, and all monetary support and give it all back to the hospital because we believe in doing something bigger than ourselves by giving back and being united for the cause. All your donations are tax-deductible and will make miracles happen for families who desperately need them. To make a safe and easy online donation to a member of our team, click on the "Roster" tab and then on a participant's name. We need your help to reach our goal For The Kids. Thank you so much for supporting our team's efforts! This year our Team is on a mission to save kids and needs your help. The Children's Miracle Network Hospitals treats thousands of children each year, regardless of their family's ability to pay. These kids are facing scary stuff like cancer, cystic fibrosis, and injuries from accidents to name just a few. This year our team is on a mission of matching our 2018 goal of $25,000. We not only want to match this goal but we want to exceed it! How will we do it? We will have 4 different Marathons planned throughout 2019 with the first one happening in March. 4 Marathons Are Coming in 2019 with great prizes from all the companies you love in the industry such as Bungie, Microsoft, Sony, Nintendo, Xbox, and much more! Dates: Spring, Summer, and Fall. More Details Soon! Not everyone is financially capable of contributing! If all were so easy, why none would suffer in this world! If you want to help out but can't afford to donate, you can consider joining our team and also spread the word about the team and our streamers through social media! To donate towards our team's goal, you must choose one of our fantastic and wonderful members to donate to! You can view the entire team roster by clicking the roster tab above. Each individual page will tell you who the Extra Lifer is and which hospital they play in support of. Thank you for your generosity, and remember, every penny of it is For The Kids!